ANASA team tasked with fleshing out President BarackObama?s overhaul of the nation?s human spaceflight program has briefedNASAAdministrator Charles Bolden and his deputy on a deep space explorationplanthat rejects some key assumptions of the president's strategy butaligns with aversion of the NASA authorization bill approved by the full Senate inAugust. 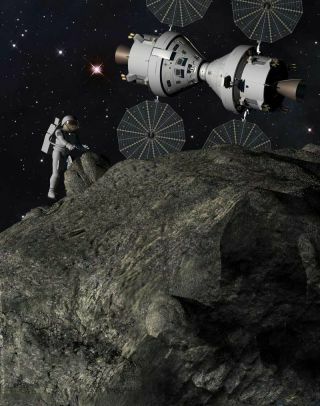 Dubbedthe HumanExploration Framework Team(HEFT), the group of NASA field centeremployees spent four months looking at the hardware that would beneeded toheed the president's call for sending astronauts to an asteroid by 2025. Inoutlining a humanasteroid missionthat would launch several years past Obama's2025 deadline, the HEFT recommended NASA begin work immediately on aspaceshuttle-derived heavy-lift rocket, skipping the five years ofexploratoryresearch Obama proposed. A set of the HEFT's charts, dated Sept. 2,were postedon the NASA Watch website. "Thereis no benefit to delaying work" on theheavy-lifter, the charts say, adding that waiting until 2015 to selecta basicdesign would limit NASA's options and hamper exploration planning. NASAspokesman Michael Braukus said Sept. 10 that Bolden,NASA Deputy Administrator Lori Garver and Doug Cooke, NASA associateadministrator for exploration systems, have been briefed on the HEFT'sfindings. He said no decisions have been made. Butthe HEFT?s preliminary assessment found key elementsof the president's plans untenable and recommended NASA beginimmediatelybuilding a space shuttle-derived heavy-lifter and retaining Orion for deepspace missions, according to the briefing charts. Beforeproposing a shuttle-derived design that representsNASA's best choice for an exploration-class rocket capable of boosting100metric tons into orbit, the HEFT considereda heavy-lift designthat would incorporate kerosene-fueled mainengines and boosters of the sort the Obama administration has talkedaboutdeveloping under its $3 billion heavy-lift propulsion researchinitiative. However,building such a rocket, the HEFT charts say,would cost more than NASA could afford without help from the U.S.DefenseDepartment, which currently relies on the Russian-built RD-180 keroseneengineto power the Atlas 5 rocket. TheHEFT plan also incorporates the Orion crew capsule,but says building a crew lifeboat for the station "diverts near-termresources" that could be better aligned with advancing human spaceexploration beyond low Earth orbit. Instead, the HEFT proposesdeveloping anOrion-derived direct-return capsule and a separate, in-house NASAeffort tobuild an exploration spacecraft. Topay for the architecture, the HEFT recommends focusingtechnology development on sending humans beyond low Earth orbit anddrawing onproposed investments central to Obama's vision ? including flagshiptechnologydemonstrations, robotic precursor missions, heavy-lift propulsiontechnologies,exploration technology demonstrations and human research. InAugust, the Senate approved a three-year NASAauthorization bill that calls for spending $2.75 billion next year tobeginbuilding a heavy-lift launcher initially capable of delivering between70 and100 metric tons to low Earth orbit and continuing development of a crewvehiclefor space exploration missions by 2016. FormerNASA Administrator Mike Griffin said in a Sept. 9speech on Capitol Hill that the Senate bill should remove the 70 to 100metric-ton minimum and retain language that requires an operationalcapabilityof at least 130 metric tons, though he said "150 metric tons would beenormously better, if we are to build the technical means for mannedjourneysto Mars in this century."